As a development professional, I spend a lot of time on the road. Today alone, I clocked 12 hours in the car and drove through four states. I thought I’d share these yoga poses that provide renewal and refreshed circulation for business travelers and road-trippers alike, after long hours on the road. After long hours in the car—whether you’re driving or just sitting—your legs will begin to feel tired and you'll need movement to improve circulation. This simple hip opener will give your legs and hips a much needed stretch, and you'll be able to feel the release in your lower back too. When driving, we have a tendency to lean forward and hunch over the steering wheel. Doing so can cause tightness in the neck, shoulders, and back. Holding the arms in Eagle Pose for 5 breaths on each side can alleviate the tension in your neck, shoulders, and back, giving them a much-needed stretch. Muscles can feel stiff and stagnant from facing one direction for a prolonged period. Incorporating a twist is a great way to introduce gentle movement back into your back, legs, and hips. Be sure to imagine your spine twisting upwards as you deepen the pose through your exhale. It’s easy to get stuck in one position wherever your tailbone and sacrum naturally fall when you are seated driving. The smooth transition between Cat and Cow will stretch your neck, back, and shoulder muscles, as well as bring back needed mobility to the lower back, shoulders, and core. We all know Child's Pose is an all-around amazing resting pose. But for a Thread the Needle variation, find opening in the shoulders and space around either side of the spine. Spend 5 breaths with your arm extended underneath the other, then do the same on the other side. 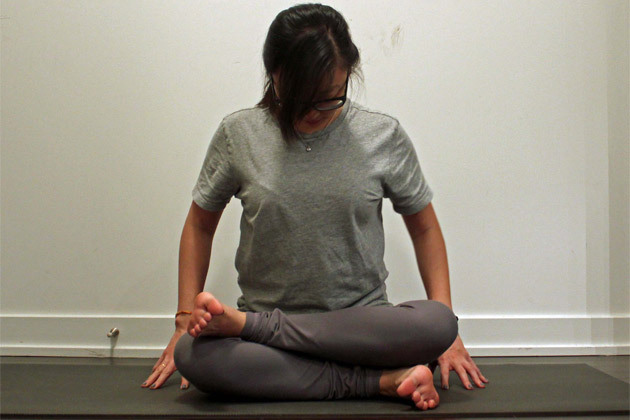 This way, you’ll get the perks of this restorative pose but with a twist—literally. Bonus: When you take your stop to fill up at the pump, find your Warrior I to access your hip flexor while you restore your tank. When on the road, try to change positions once every 30 minutes to maximize circulation. Don’t forget to have fun along the way! Just because you have a clear destination in mind doesn’t mean you should forget about the journey. Notice the colors, the foliage, and where the sun (or moon) is in the sky! By Rachel Jason – Rachel is a Wisconsin-based yoga teacher. Her love of yoga fits well with her pursuits of philanthropy and education advocacy. When in need of relaxation, Rachel finds Happy Baby; when desirous of conquering the world Pinky-and-the-Brain style, she finds the empowering Warrior II.